TWO: Scoop the Basic Lotion Base into the disinfected container, and heat in the microwave in 10 second bursts, stirring between each heating burst. Be very careful to not heat the lotion above 130 °F, or the preservative can become ineffective. 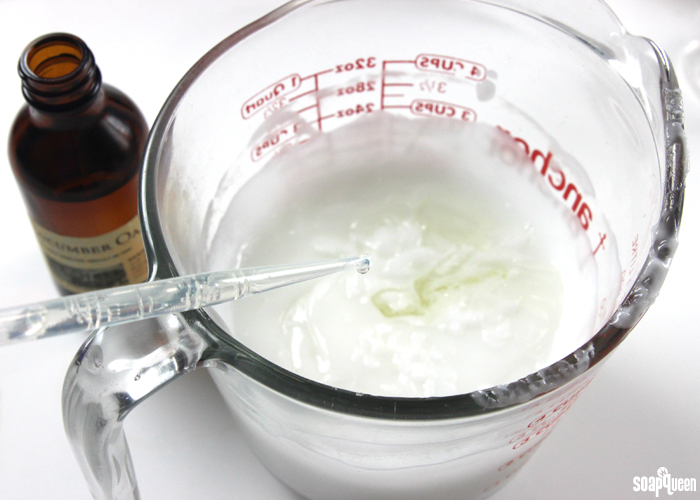 The lotion should become slightly more liquid and pourable at around 115-120 °F. THREE: Add the cucumber extract and Cucumber Oak Fragrance Oil and use the stick blender to emulsify the ingredients together. Stick blend for about 30 seconds to 1 minute. 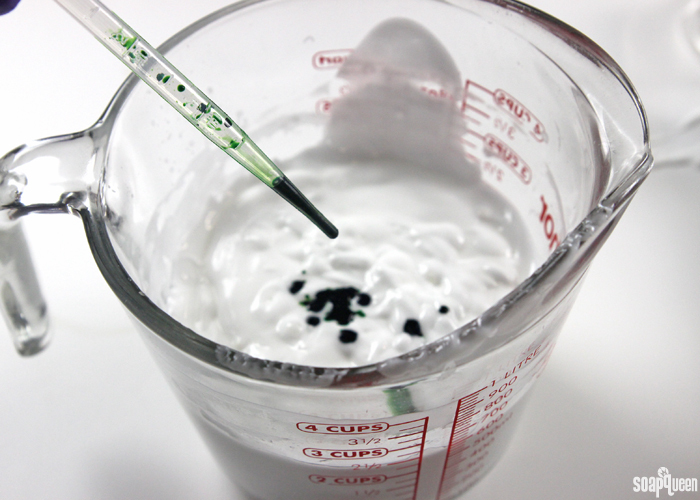 FOUR: Add the diluted Emerald LabColor to the lotion (click here to learn how to dilute the LabColors). Stick blend the LabColor into the lotion until completely combined. FIVE: Add the Kermit Green Mica, and stick blend until the mica is completely incorporated and there are no clumps. Continue to stick blend the mixture for about another minute, just to make sure the lotion is completely emulsified. SIX: Transfer the lotion into the 4 ounce jars. Allow the lotion to cool without a lid for about 1-2 hours before capping and enjoy! Please note that this lotion is preserved for just the addition of fragrances, essential oils and extract – not a lot of extra oils or butters so stick to just adding minimal amounts of fragrance and extracts to make sure you don’t break the preservative system. 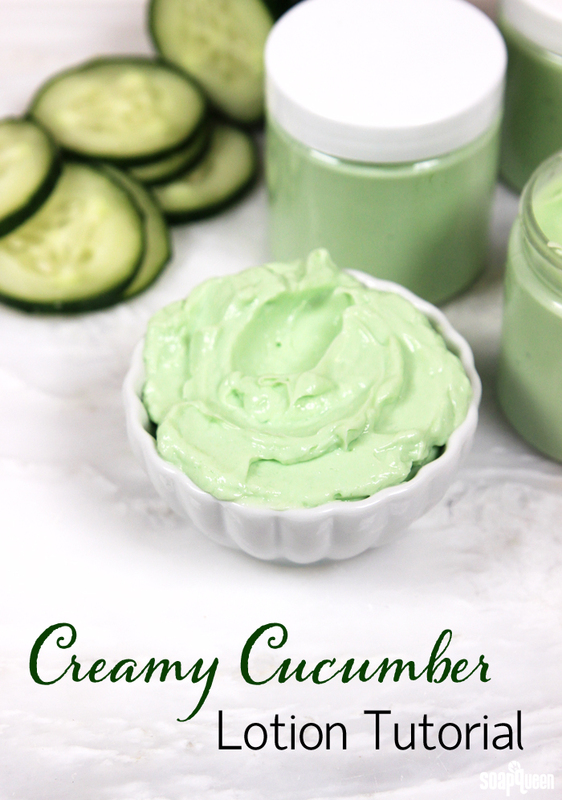 This cucumber contains cucumber extract along with a fresh scent and color. Scoop the Basic Lotion Base into the disinfected container, and heat in the microwave in 10 second bursts, stirring between each heating burst. Be very careful to not heat the lotion above 130 °F, or the preservative can become ineffective. 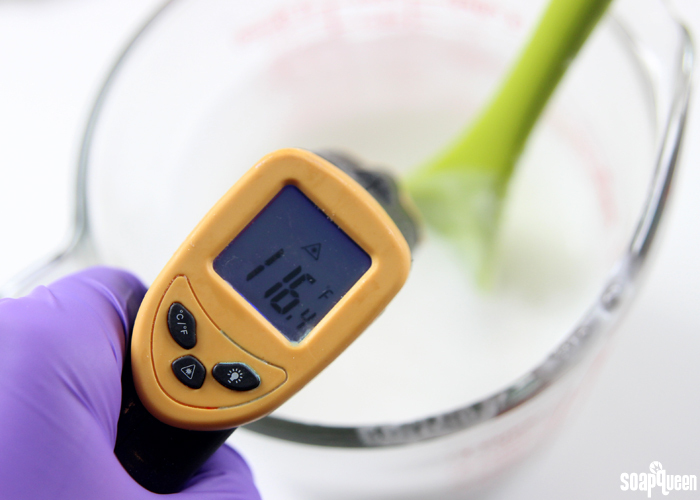 The lotion should become slightly more liquid and pourable at around 115-120 °F. 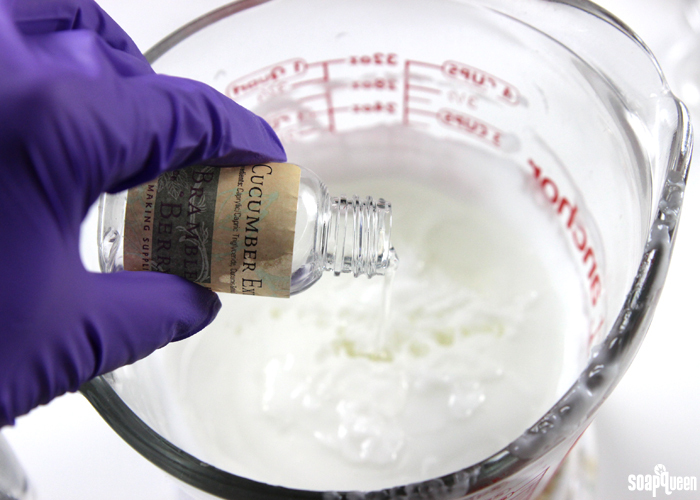 Add the cucumber extract and Cucumber Oak Fragrance Oil and use the stick blender to emulsify the ingredients together. Stick blend for about 30 seconds to 1 minute. 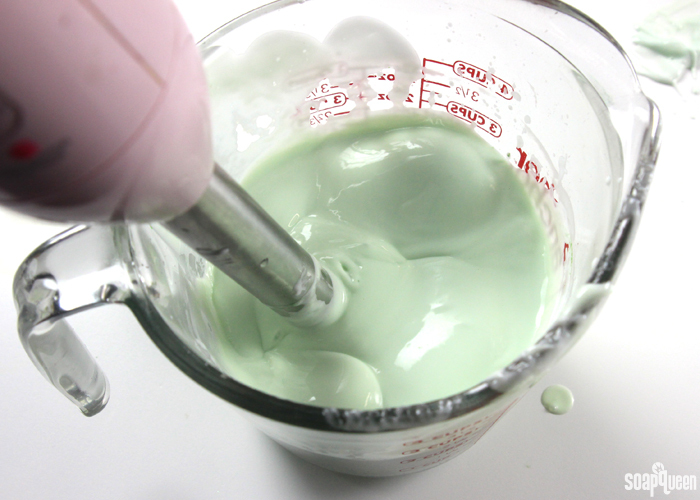 Add the diluted Emerald LabColor to the lotion (click here to learn how to dilute the LabColors). Stick blend the LabColor into the lotion until completely combined. Add the Kermit Green Mica, and stick blend until the mica is completely incorporated and there are no clumps. Continue to stick blend the mixture for about another minute, just to make sure the lotion is completely emulsified. Transfer the lotion into the 4 ounce jars. 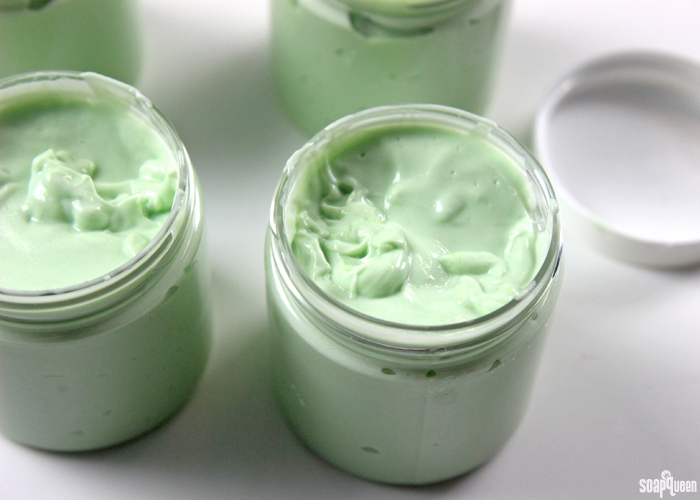 Allow the lotion to cool without a lid for about 1-2 hours before capping and enjoy! 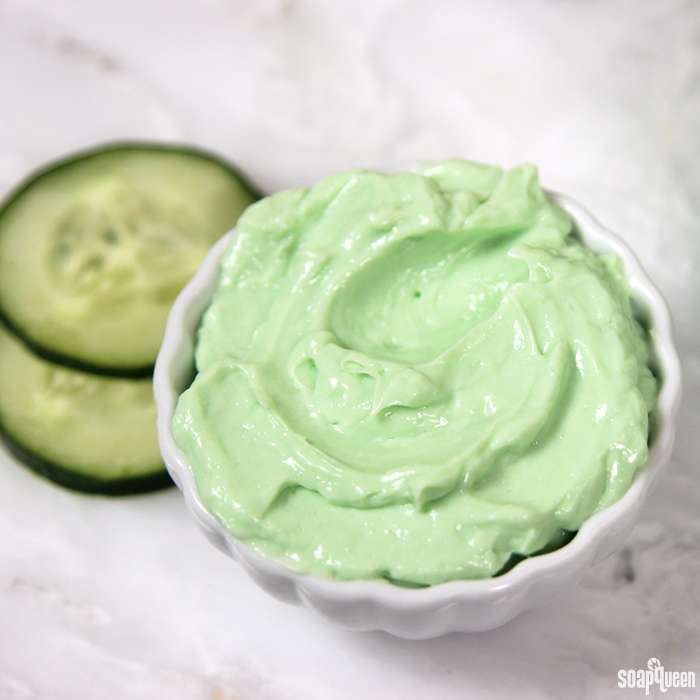 How can I save the lotion if I accidentally put too much of cucumber extract? Now it has a very concentrated sense. Do you have the expiration periods on your recipes anywhere I cold look it up? 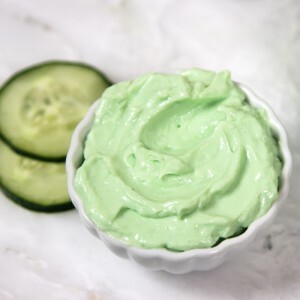 Just a question regarding lotion: If I use aloe Vera gel (which has been reconstituted and preserved) instead of water in a lotion, would it still need to be preserved? I wasn’t sure, since the aloe contains a preservative anyway…. can i use just the Mica and skip the Labcolor? would that make a difference? This is not a lotion question but I read your baby oil recipe and really wanted to ask! If I make a body oil with cocoa butter as one of the ingredients (5 parts oil, 1 part cocoa butter) , will it stay liquid when it cools down? Aside from the properties, I love the scent of cocoa butter!! But please do recommend the oils!!! Cocoa butter does have such an amazing scent, I love it too! I think you’ll really like whipped body butter. 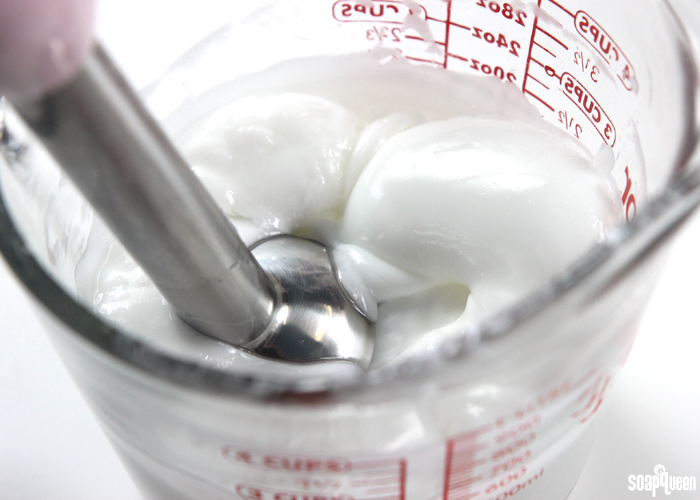 Whipped body butter is a mixture of oils and butters. It’s very thick and moisturizing. Hello….when it comes to step #4, it refers me to another link for diluting directions. Under that post on step#5 it’s says to add something that didn’t come in my kit 🙁 Was I suppose to get it or can I leave that stuff out? Ok thanks.. wish I would have known that. I would have ordered it at the same time as the kit. 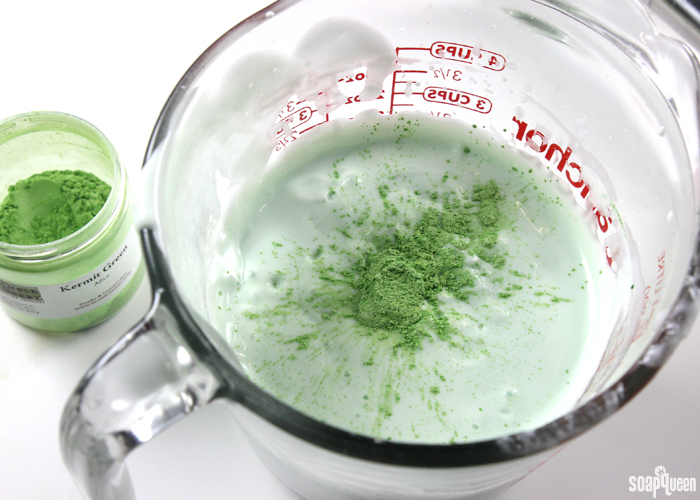 Hi, can I use wheatgrass powder to color the lotion instead of mica and lab color? Hi, I left a question somewhere…now i can’t find it..lol I will ask it here ok? 1.First, I’m loving this sight. 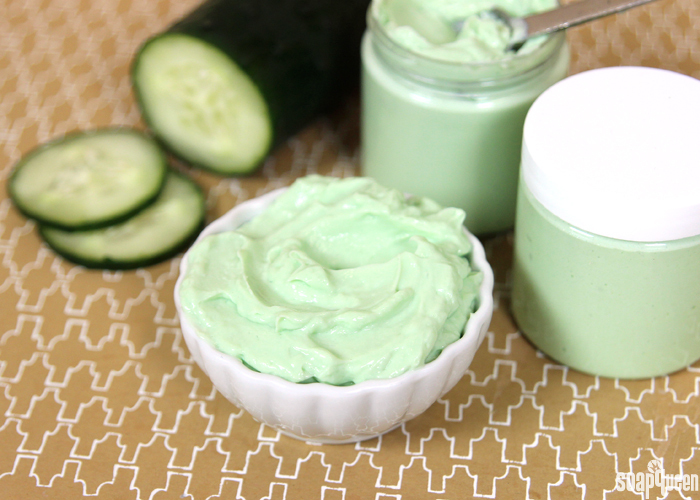 I may just try this cucumber lotion. Here are my questions. Can you use that same fragrance in soaps? When you click the order these products do you get only enough product for this tutorial (like a kit) or will there be leftovers? 2.Also, I wanted to know about the zap tasted test when making soaps. Do you do the zap test on hot AND cold process soaps, only the Hot process? I tried to make a cold process batch today and don’t remember doing the zap test. When do you need to do that? 3. Last question…. I tried to make a hot process batch last night, and mistakenly used an aluminum slow cooker 🙁 plus, I added the oatmeal when it was really hot. Seemed like I was just cooking oatmeal..lol It never did get thick, so I just poured it in a mold. I did the zap test on it and it stung my tongue 🙁 Can I just let that set out and dry for a few months and then will it be ok to use? or was that a waste of good coconut oil? LOL. Thanks so much, glad you’re enjoying the site! Itchy skin can be due to several reasons. For instance, if a high amount of coconut oil is used (more than 33%), it can cause dryness and irritation on the skin. It may also be due to the fragrance or essential oil used. For instance, Clove Leaf Essential Oil can cause irritation at higher usage rates. Can you tell me more about your recipe, including what fragrance and essential oil you used? For storing your soap, we recommend a cool, dry place with lots of air flow. You can definitely cure the soap in your garage! I wouldn’t recommend your patio, as it can come in contact with outside dust and debris. As for challenges, you may like Great Cakes Soap Works! They host challenges every month: https://www.greatcakessoapworks.com/ It’s something we will also look into for 2016. Is it OK to leave out the mica and the lab color? Can you use cucumber melon frangrance oil with this recipe?